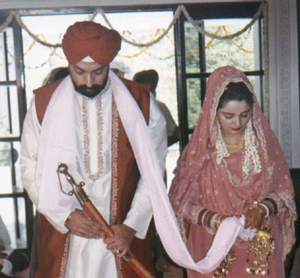 The premier website for Sikhs in search of marriage, Gursikh Matrimonials provides a fast, free, easy to use database of over 2500 entries from all over the world. The people who list on this site are those who do not cut their hair or take intoxicants, do not consider caste and are looking for similar persons for friendship and marriage. 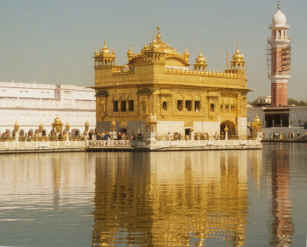 Harmandar Sahib, Amritsar, Punjab. Copyright 2001 Paramjit Singh Sawhney. Please read and understand the mission statement before submitting your listing, and feel free to browse (**new photos only feature**) or search the matrimonials. Check out the recent comments from visitors. Recently married couple during Anand Karaj ceremony. Couple found each other through gurmat.com, with Guru's Kirpa. Our congratulations to them!